As a family-owned business we are based in Lincolnshire but operate nationwide. This year we have worked from Inverness to Southampton, with many stops in between. No job is to big or too small – from tap washers to 400 kW biomass boilers. For reliable heating engineers and plumbers in Lincolnshire and the East Midlands, please call us. Microgen for Home and Business offer a full range of skills from electricians, air conditioning, heating engineers and plumbers. Our engineers install and service products from all the major manufacturers, in both the domestic and commercial sectors. With more than 25 years experience in the heating and plumbing industry we have also been fitting the new renewable technology for the last 7 years. Industry now needs to find better ways of heating buildings and generating electricity. Recent training covered refrigeration, heating, and air conditioning – helping us to better understand the new heat pump technologies and HETAS requirements. HETAS is the official body responsible for the approval of biomass and solid fuel heating appliances, fuels and services. This also includes the registration of competent installers and servicing businesses. Our Heating Engineers are Gas Safe Registered and qualified in all forms of plumbing and heating. 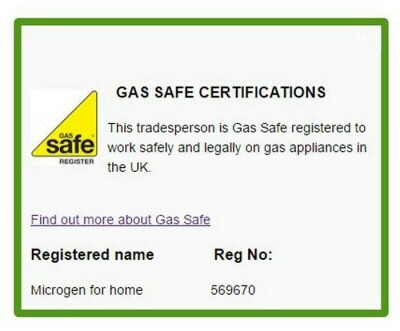 Gas Safe is the official registration scheme which now replaces that run by Corgi. Our Gas Safe registration number is: 569670.